CyPo­sium — the book will be pre­sented at Trans­me­di­ale 2015, with a repeat of the launch per­for­mance. 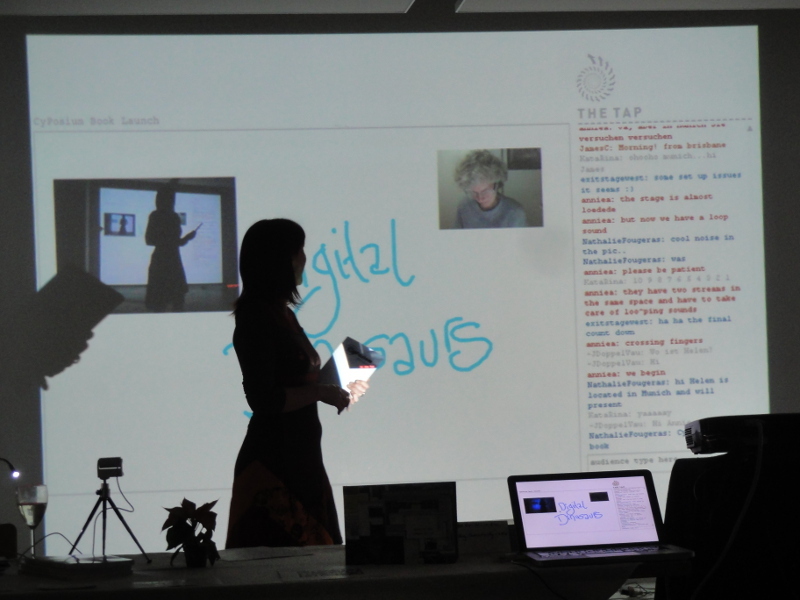 This cyber­for­mance, deliv­ered by some of the book’s con­trib­u­tors and CyPo­sium organ­is­ers, fea­tures read­ing of excerpts from the book along with impro­vised visu­als includ­ing web­cam imagery and live drawing. The pre­sen­ta­tion will take place online and in the Foyer at Trans­me­di­ale, from 2-3pm on Sun­day 1 Feb­ru­ary 2015. Click here to find your local time. Online audi­ences enter here — it will be acces­si­ble shortly before the per­for­mance starts. The book will be pre­sented by Helen Var­ley Jamieson at Trans­me­di­ale, with cyber­form­ers Adriene Jenik (USA), Clara Gomes (Por­tu­gal), James Cun­ning­ham (Aus­tralia), Joseph Delappe (USA), Liz Bryce (Aotearoa New Zealand), Maria Chatzichristodoulou (UK), Mil­jana Perić (Ser­bia), Nathalie Fougeras (Swe­den), Roger Mills (Aus­tralia), Suzon Fuks (Aus­tralia), Vicki Smith (Aotearoa New Zealand) and oth­ers to be confirmed. You can view a record­ing of the launch cyber­for­mance here. CyPo­sium — the book: edited by Annie Abra­hams and Helen Var­ley Jamieson, pub­lished by Link Edi­tions and La Panacée; more infor­ma­tion and links to down­load (free) or pur­chase the hard­copy here.